PAD Pittsburgh Association of the Deaf, Inc.
A major concern for children who are deaf or hard of hearing is the development of spoken-language skills. 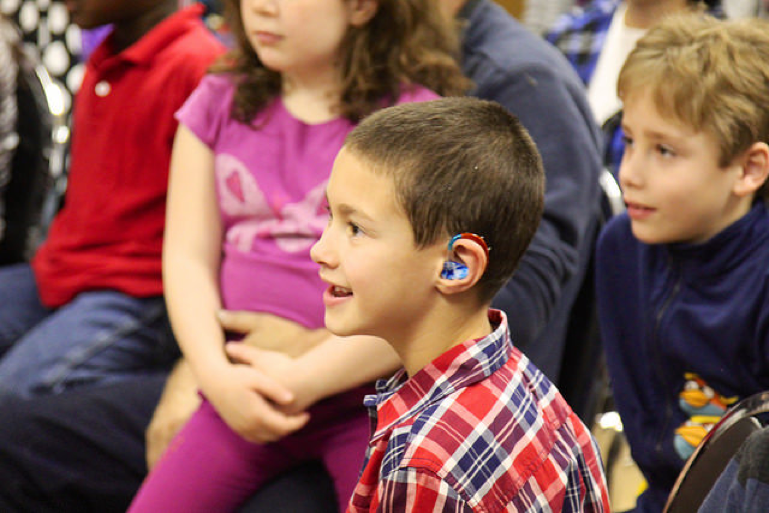 Advances in technology including cochlear implants, bone anchored hearing aids, and digital hearing aids, help children with hard of hearing develop language on par with their peers. Although many children can develop highly intelligible speech and vocabulary, their pragmatic skills may lag behind their peers. Pragmatics is language use. Pragmatics involves three major communication skills: using, changing, and following rules of language. A person may speak with variety syntactically complex sentences with clear articulation, but lack the appropriate conversational skills. Theory of mind (ToM) is the ability to understand that others can have beliefs, emotions, and perspectives different than your own. Theory of mind can be divided into cognitive and affective. Cognitive ToM is the ability to attribute specific emotions to yourself and others. For instance, “I am sad when I lose at a game, but my friend is happy when she wins”. Affective ToM allows a person to reflect on their own emotions and empathize with others. For example, if Sally pushed Megan she should realize why it is wrong to push a friend and empathize with Megan feeling sad. Research has shown that children hard of hearing are at risk of ToM deficits. — Poor metacognition skills: Difficulty comprehending while listening and reading, and uses fewer strategies to determine the meaning. — Difficulty interpreting emotions of others. Children with hearing loss may misinterpret their peer’s mental status and the cause of their feelings. — Poor self-awareness. Children with hearing loss may lack awareness of their own emotions. If a child has difficulty understanding how they are feeling, they may also lack strategies to regulate unwanted emotions. The reason for ToM difficulties can be attributed to reduced incidental learning. Children with hearing loss need to exert more effort to listen than hearing children especially in noisy rooms or when listening to multiple speakers. Stress and fatigue may occur during these incidences and reduce their ability to pick up on cues that are important for interpreting thoughts and feelings of others. Speech therapy can help children with hearing loss develop the necessary pragmatic skills to develop theory of mind, regulate emotions, and pick up on social cues more easily. If your child is hard of hearing and/or has pragmatic deficits, contact Lumiere Children’s Therapy for a consultation with our speech therapist. Westby , C., PhD. (2017 , April). Keep This Theory in Mind. The ASHA Leader , 18-20 . Older PostMy Child is Walking, Now What?